Campbell thinks it can work through its corporate crisis by making a big change to its strategy. The company announced Thursday that it is selling Campbell Fresh, which includes Bolthouse Farms juices, carrots and salad dressings, Garden Fresh dips and tortilla chips and Campbell's own refrigerated soups. Campbell (CPB) is also selling its international business, which includes Tim Tam cookie maker Arnott's and Kelsen Group. The decisions are the result of a full operational review the company began in May, in the wake of poor sales and a reportedly rocky integration of snack company Snyder's-Lance, which Campbell completed in March. Campbell is struggling with many of the same problems facing the food industry: Prices have sunk to the floor as Amazon (AMZN), Walmart (WMT), Costco (COST) and Kroger (KR) have ramped up their battle for customers. Changing consumer tastes and aluminum tariffs exacerbated Campbell's woes. But Campbell has also shot itself in the foot with bad bets. On a conference call with analysts, Interim CEO Keith McLoughlin said the company aggressively pursued the health "megatrend" without considering what differentiated Campbell from its dozens of rivals that were doing the same exact thing. He said Campbell depended too much on mergers and acquisitions and lost focus on its own products and brands. "It's abundantly clear to me that the company is in need of greater focus and discipline," McLoughlin said. Now, Campbell is bolstering its most popular brands. McLoughlin said that Goldfish, Pepperidge Farm cookies, Snyders, Late July snacks and Cape Cod and Kettle chips will drive about 70% of the company's growth. Campbell plans to invest in marketing, innovation, manufacturing capacity and e-commerce for each of the six brands. McLoughlin said in a statement on Thursday that the board considered a full sale of the company among other options, but ultimately decided that divesting of the two businesses was best. "The board remains open and committed to evaluating all strategic options to enhance value in the future," he added. McLoughlin said that the sales will allow Campbell to focus on its core US businesses, including canned and microwavable soups, V8 and Pepperidge Farm snacks. They should help bring down the company's debt. The company also reported earnings on Thursday. Sales in the three months ending in July grew 33% from the same period last year, but that growth was entirely owed to Campbell's acquisitions of Snyder's-Lance and Pacific Foods, which make soups and plant-based beverages. Campbell bought Pacific last year. Without those new businesses, Campbell's sales would have fallen 3%. 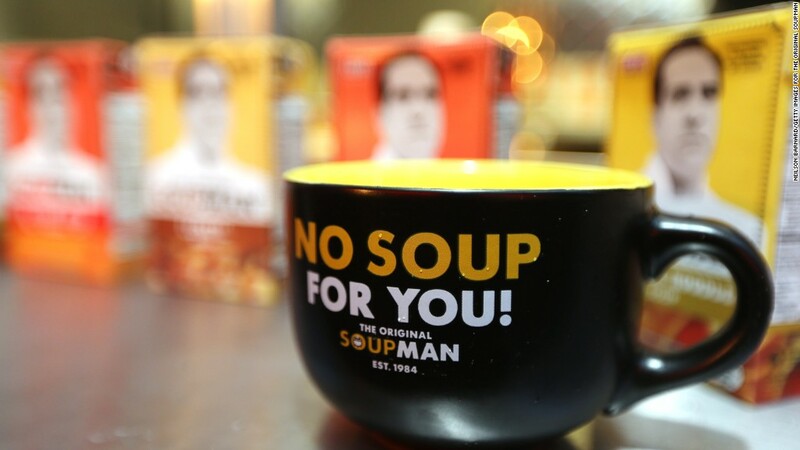 Without Pacific, the company's soup sales would have fallen by 14%. Internal turmoil has roiled Campbell: The company's longtime CEO Denise Morrison also abruptly retired in May. "Fiscal 2018 was a challenging year for Campbell," said McLoughlin. "These results and our outlook for fiscal 2019 reinforce the need for the significant actions we announced this morning." Investors have called for the company to sell itself altogether. Third Point LLC, which owns 5.65% of the company, said earlier this month that "the only justifiable outcome of the strategic review is for [Campbell] to be sold to a strategic buyer." The company tapped Goldman Sachs and Centerview Partners to help it with the sale. Campbell's stock slumped nearly 17% this year and fell another 6% in premarket trading Thursday. Campbell was not alone in its efforts to attract healthier eaters. Others, including PepsiCo, have offered healthier foods to appeal to increasingly calorie- and sugar-conscious consumers.